For longer than you’d like to admit, you’ve had sensitivity in the first molar on the lower right side of your mouth. Drinking hot coffee or cold ice water is always a problem and you have to consciously avoid coming in contact with that area. And, for the past few weeks, the tenderness has increased and is a constant problem – your mouth is chronically sore. When you see Dr. Angelo Julovich, your dentist in Zionsville, he tells you that you have an oral infection and that a root canal will end the pain. In this post, he discusses what root canal therapy is and how it can benefit you. Root canal therapy is a way to cure oral infections of the tooth root. The pulp – the inner layer of the tooth – can become inflamed and diseased. This usually happens when cavities eat through the enamel and dentin, and the decay infects the pulp. Generally, your tooth will be sensitive, and you’ll notice pain when you chew – although patients who have no pain sometimes need root canals because the infection has compromised the nerve of the tooth past the point of feeling pain. 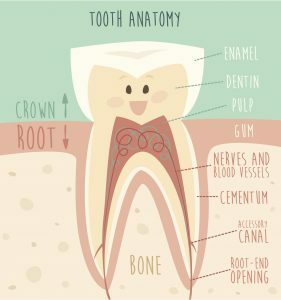 What Happens In A Root Canal? In this procedure, Dr. Julovich will numb the area to make sure you are completely comfortable throughout your treatment. He’ll open the tooth to access the diseased area and will remove the infected pulp. Dr. Julovich will then fill in the area where the pulp was with a biocompatible substance called gutta-percha. At that point, he’ll place either a tooth-colored-filling or a porcelain dental crown over the top to protect the treatment. Then, you’ll be done – the pain will be gone, and you’ll have a lot to smile about. Will Having A Root Canal Hurt? This is a common myth among patients, but contrary to popular misconception, root canals actually treat your pain. Since the infection is what is causing your discomfort, removing this tissue will relieve the aching, sensitivity, and tenderness you’ve been feeling. Will A Root Canal Be Expensive? Since root canal therapy is a necessary medical treatment, most patients have coverage for this procedure. At our practice, we proudly accept many plans – we’re happy to submit claims to any provider. We also offer CareCredit financing for those who may be worried about gaps in their insurance. Now that you know what a root canal is, that it’s actually the answer to end your pain, and that you can afford to have the discomfort taken care of, schedule your appointment with Trinity Dental today!